How Does My Car Know if There is a Low Tire? In response to automobile traffic safety issues and at least one U.S. Government mandate, virtually every vehicle sold in North America since 2007 has some type of tire pressure monitoring system (TPMS). The chiefest of these mandates is known as the Transportation Recall Enhancement Accountability and Documentation (TREAD) Act, and each TPMS is built around one of two basic, electronic designs. In most cases, the TPMS utilizes a stand-alone controller that interacts with other controllers only when necessary. However, there are vehicles in which the TPMS piggy-backs other controllers such as the powertrain control module (PCM), electronic brake control module (EBCM), body control module (BCM), instrument panel controller (IPC), or the general electrical module (GEM). This type of TPMS utilizes the same wheel speed sensors, electrical wiring, and controllers that are used by the antilock braking system (ABS). This type of TPMS saves time, space, and money but it does have its shortcomings. Electromagnetic wheel speed sensors are placed in close proximity to toothed, steel reluctor rings that are then attached to a drive axle or brake rotor. As the wheel is turned, the teeth on the reluctor ring pass very near the wheel speed sensor and creates a voltage waveform pattern. This waveform pattern is seen by the respective controller as vehicle speed. By measuring the rate of evolution from each wheel speed sensor and comparing the data, the appropriate module can determine the size of the tire and the rate of inflation. Wheels that are turning at a higher rate of speed than others are assumed to be underinflated. If the TPMS controller determines that any of the tires are not inflated properly, the appropriate instrument panel warning lamp will be illuminated until the condition is rectified and the code is cleared. This type of TPMS utilizes dedicated pressure monitoring sensors that are integrated into the valve stem of each wheel. These often fragile sensors not only monitor air pressure but also frequently monitor tire temperature. Direct tire pressure sensors transmit data wirelessly to the centralized TPMS controller where it is calculated. If the TPMS controller determines that any of the tires are not inflated properly, a warning lamp will be exhibited in the instrument panel. Direct TPMS differs greatly between automakers and often require special tools and equipment to diagnose and repair malfunctions. Tire pressure sensors are programmed to match the TPMS controller and marked with their own serial numbers. Direct TPMS are often of a proprietary design and will function only on certain vehicles. 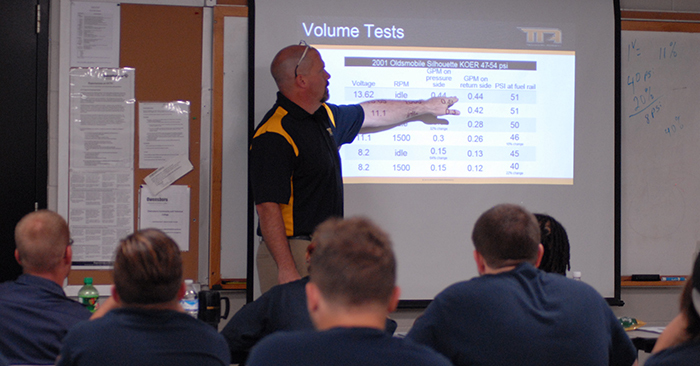 Factory training may also be required to repair or replace tire pressure sensors indirect TPMS. While tire pressure sensors can be fragile and expensive, they do provide direct air pressure (and sometimes temperature) data from inside the inflated tire. The wireless sensors are equipped with batteries that have a life expectancy of approximately a decade. Unlike indirect TPMS, direct TPMS require only resynchronization after tire replacement or rotation (as opposed to reprogramming), but tire pressure sensors are often damaged when mounting or dismounting tires. Ensure that all tires are in good condition and inflated to the appropriate level before attempting to diagnose a TPMS malfunction.